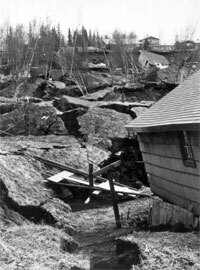 Alaska: 49th Anniversary of "Good Friday" Earthquake - Forty-nine years ago today at 5:36 pm, the largest earthquake ever recorded in North America, and the second largest in history, shook coastal Alaska for close to 4 minutes. Alaska Earthquake March 27, 1964. Damage to houses from landslides in Turnagain Heights in Anchorage. At first, the ground rocked gently and most people weren't concerned, for they had experienced a lot of Alaskan quakes and had learned that they were a part of life. However, the gentle rocking increased, and the ground soon began to surge underfoot. Huge fissures opened and closed in the ground. Alaska's largest city was to be devastated in minutes. Anchorage began to crumble as the shaking continued. Houses and buildings twisted and collapsed. Lamp posts fell over. Trees were uprooted. Unable to remain standing, people clung to lamp posts, cars, and each other in an attempt to keep from being knocked down. For approximately four minutes, the ground shook. When it was finally over, Anchorage was in ruins, a victim of a massive magnitude 9.2 earthquake, the second largest earthquake ever recorded in world history. This historic quake was just the start. Underwater landslides gave way to local tsunamis destroying coastlines from British Columbia to California. According to the United States Geological Survey (USGS), the number of deaths from the earthquake totaled 115 in Alaska. The USGS reported the death toll was extremely small for a quake of this magnitude due to low population density, the time of day and the fact that it was a Good Friday holiday, and the type of material used to construct many buildings (wood). A combination of shaking, tsunamis, landslides, and liquefaction destroyed buildings, houses, roads, and other infrastructure. Coastal land-level changes of as much as 36 feet of uplift occurred in one area and 6 feet of subsidence in another over a region two-thirds as large as the state of California. This great earthquake was felt over a half million square miles and resulted in at least $350-500 million in property damage in Alaska in 1964 dollars, a figure over $2 billion today. 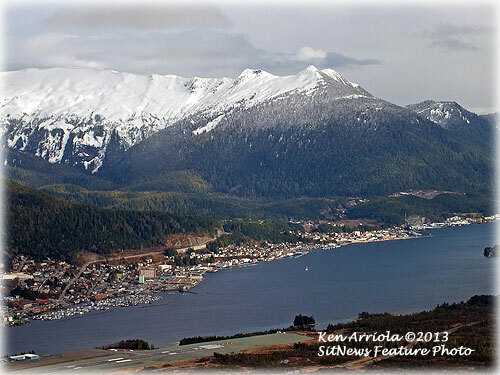 Ketchikan: Citizen Report Leads to Drug Bust - Officers of the Ketchikan Police Department received a call Monday afternoon from a citizen stating they had just oberved what appeared to be a drug transaction on Dock Street. Two individuals were contacted by Ketchikan police officers and during the course of the investigation, officers obtained a search warrant for a silver Nissan truck. Southeast Alaska: State of Alaska Roadless Rule Case Dismissed by D.C. District Court - The U.S. District Court for the District of Columbia on Monday ended a challenge by the state of Alaska against a nationwide Clinton-era rule protecting tens of millions of acres of roadless forest lands from logging and road building. The Alaska case was the final litigation challenging the rule nationwide. The court held that no further challenges are allowed, because the statute of limitations has run out. The Associated Press reported that U.S. Sen. Mark Begich (D-Alaska) called the ruling frustrating. Unemployment in the region, he said by email to the AP, hovers around 15 percent. "Southeast Alaska needs more jobs - not more federal regulations," he said. Alaska: One Of Five Co-Defendants Convicted Of Embezzling From Trident Seafoods- A Washington woman was sentenced for her role in embezzling $289,000 from Trident Seafoods. Anne Wilson, 31 of Kent, Washington, was sentenced on March 21st by Chief U.S. District Court Judge Ralph R. Beistline, to 16 months in prison. According to Assistant U.S. Attorney Aunnie Steward, from January 2008, and continuing until August 2010, the lead defendant Isairis Wolfe, used her position as the book keeper for Trident Seafoods in Kodiak, to write Trident Seafoods checks to four of her personal associates Anne Wilson, Jeremy Smith, Valerie Olivares, and Jamie Fathke. Wolfe, using her check writing authority at Trident Seafoods, drafted approximately 52 checks on a Trident Seafoods account for approximately $500,000, and made them payable to her personal associates Wilson, Smith, Olivares, and Fathke, as well as to Wilson's minor son L.E. The checks were negotiated by Wolfe and her associates and they shared the proceeds. Wolfe concealed the fraud by creating fraudulent accounting records so that the payments appeared to be legitimate. Wilson and Wolfe met while working together at Trident Seafoods. Wilson was fired from Trident Seafoods but stayed in touch with Wolfe. Wilson approached Wolfe for a loan of a few hundred dollars and instead of granting a loan, Wolfe asked Wilson to join the scheme to defraud Trident Seafoods which she agreed to. Over a two and a half year period, Wilson negotiated 28 fraudulent checks that were made out to both her and her minor son that totaled $289,660. Wilson kept half of the money from the fraudulent checks and provided the remaining half to Wolfe. Wilson admitted that she wired some of the money from the fraudulent scheme to the father of her children who was in Mexico, knowing that he was a fugitive for a murder charge in Texas.